MyTractorForum.com - The Friendliest Tractor Forum and Best Place for Tractor Information > Lawn and Garden Tractors > Backyard Round Table - L & G Tractor Related Topics > Totally digging my Husqvarna TS348D! Totally digging my Husqvarna TS348D! She's a beast! I've had her for a few days and I've been working her like a dog. 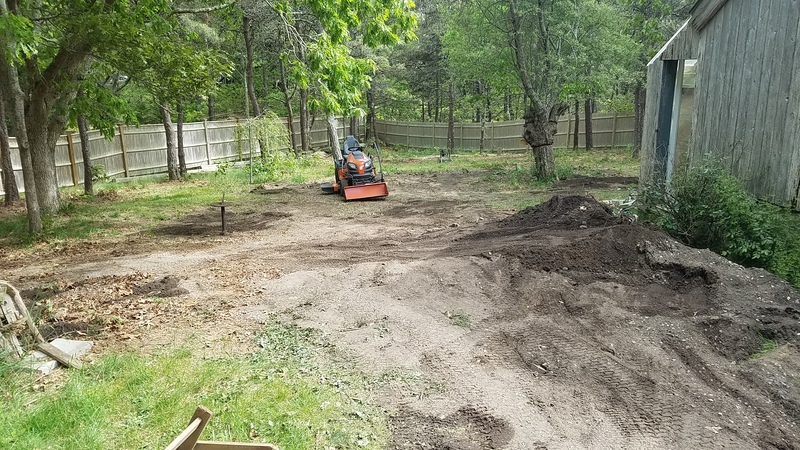 I picked up a front scoop and have been using her to move and level fill around my yard. I've got 4hrs on her so far. 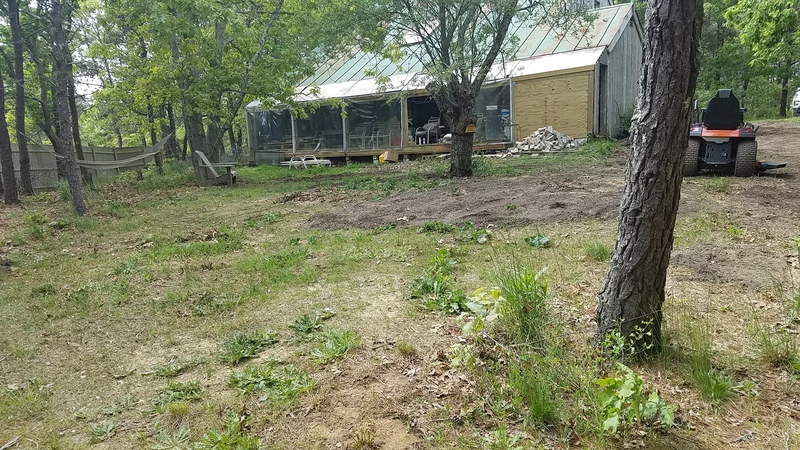 Today I'm going to drive her a mile to my elderly neighbors house and do thier 2-3 acre yard. I figure I should change the oil. The manual says change it after 25hrs, but shouldn't I change it sooner seeing how it's a new engine? Re: Totally digging my Husqvarna TS348D! Another question just came to mind, it's very dusty here, should I grease anything on a regular basis? I just got my TS348XD Thursday. I was told to do the 1st oil & filter change at 5 hours. That’s what I plan to do. If it’s dusty, just double check the air filter to make sure it’s clean. You know guys, it didn't happen without pictures! oldpaddy, how do you like the front scoop? I just picked up TS 348XD yesterday and been debating about the front scoop. Decided against it for now, got the box scraper and sleeve hitch & dump cart instead. Last edited by carreiraam; 06-03-2018 at 11:58 AM. I like it. It has its limitations, but it sure beats a wheelbarrow and shovel. I've got a dozer blade coming too. 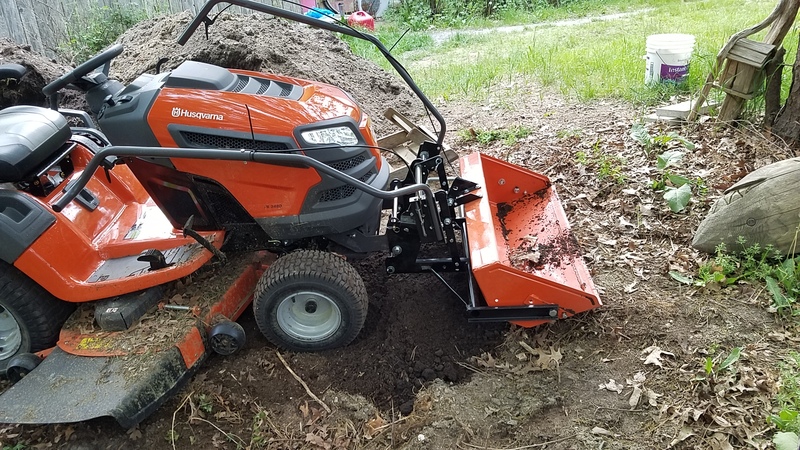 I'm about to place an order for a new GT ( Husqvarna TS 348D) and was wondering if their front scoop could be used to pick up 3/4 crushed rock and dump it over a 18-24 inch freestanding wall (about 6-9 inches wide)? Also, how wide of a trailer will need to pick the "ready to go" tractor up form the dealer? I don't believe the tractor scoop will lift that high. I know my Johnny Bucket wont. No, the scoop barely gets off the ground. There are adjustments that can be made, but I haven't gotten that far yet. I highly doubt the adjustments raise it enough for your needs. Thanks guys, that is very good to know. Doing my first oil change! And my dozer blade came in today. I'll put it together hopefully tomorrow. Man, I love this tractor! Hi all, just wanted to say that after 20hrs+ and spreading tons of fill (with more the come! ), I'm still LOVING this tractor! Other than the pain of switching between the dozer blade and the front scoop, she's a dream. I've spread tons and tons of fill and have had no problems. I've even used the dozer blade to fix a few ruts on my dirt road after a couple of nasty thunder storms. How do you like your tractor?